Jeff Weaver Retires after 8 years of Service! 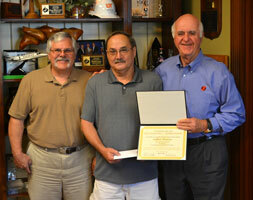 Jeff Weaver (Quality Control Inspector-Bristol) was recognized on May 29th in honor of his retirement from Strongwell after 8 years of service. Jeff began his career with Strongwell as a Sample Prep Technician and was later promoted to Lab Technician. One of the things he will miss most is his great set of coworkers. Taking advice from his brothers, he plans on relaxing during the first month of retirement while discovering new hobbies and passions along the way. Strongwell congratulates and thanks Jeff for his hard work and dedication over the years.